Desert Stays verwelkom u by ons Hentiesbaai tuiste op die web. U is meer as welkom om deur die volgende bladsye te lees om meer te wete te kom oor die akkommodasie en aktiwiteite wat u kan geniet. Kyk ook graag na ons Hentiesbaai foto gallery. Vakansie verblyf, visvang verblyf, visfees verblyf, en selfsorg verblyf sit ons op die kaart vir akkommodasie in Hentiesbaai en Namibia. Desert Stays welcomes you at our Henties Bay home on the web. You are more than welcome to browse through our website to discover more information about the accommodation and activities on offer. Also visit our Henties Bay photo gallery. Holiday accommodation, fishing accommodation, fish festival accommodation and self catering accommodation put us on the map for accommodation in Henties Bay and Namibia. The story of the discovery of Hentiesbaai ( Henties Bay ) has it that a certain Major Hentie van der Merwe from Kalkfeld discovered a freshwater spring in 1929 at the Omaruru mouth following an expedition where he lead a group in search of a rhino. Apparently he had heard of a museum in Pennsylvania offering a small fortune for a rhino skeleton and he embarked on an expedition to hunt a rhino for this purpose. Having successfully hunted the animal he realised they did not have sufficient water and set out to search for water, a necessity in the harsh desert conditions. As luck would have it he stumbled upon a patch of green reeds fed by a small freshwater spring near the current Hentiesbaai ( Henties Bay ). Major van der Merwe fell in love with this place and returned the next December to this site which is now Hentiesbaai ( Henties Bay ). He ended up spending all his holidays there. Friends joined him over the years and subsequently the holiday village of Hentiesbaai ( Henties Bay ) evolved. 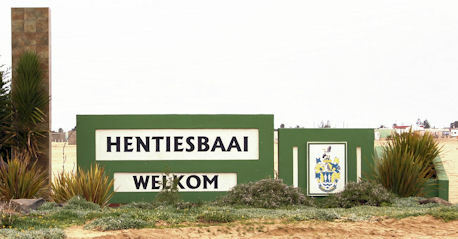 Today Hentiesbaai ( Henties Bay ) consists of almost 3000 permanent inhabitants. During the school holidays, the number of people in Henties Bay (mainly from South Africa) increases considerably. Desert Stays would love to welcome you to this angler’s paradise in Henties Bay !